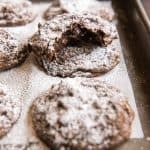 The best fudgy chewy chocolate brownie cookies are made in one bowl with cocoa powder, lots of chocolate chips, and chopped walnuts. Cream butter and sugar until light, about 3 to 4 minutes. Add vanilla and eggs and mix well. Combine the flour, cocoa, salt and soda and whisk, then add to the butter, sugar and eggs and stir to combine. Stir in chocolate chips and walnuts. Drop onto the parchment-lined cookie sheets using a scoop for evenly sized cookies. Bake for 9-11 minutes until mostly set in the center, but be careful not to overbake. The cookies will set up more as they cool. Let the cookies cool on the pan for a few minutes before transferring to a wire rack to cool completely. Dust with powdered sugar and enjoy.